This morning, around 7:00am, I awoke with a terrible pain in my stomach -- one that stayed with me throughout the day and into the early afternoon. I suspect it was not last night's dinner as Jen displayed no such pain and discomfort. Feeling nauseated all day I chanced a granola bar around noon but that made me feel terrible for about an hour so I decided to lay off food for the rest of the day. When I got home I took an hour nap and started to feel a little better after. I knew Jen was going on some sort of boat this evening for a work event so I would be on my own for dinner. I imagined that Jen was reenacting Speed 2. I imagine that I am the Keanu Reeves to the Jason Patric character who will likely be accompanying her right now and saving her from the diabolical clutches of Willem Dafoe. Given my ailment, and the large amount of leftovers building up in the fridge, I opted to simply have the leftover boiled potatoes from Peru night. 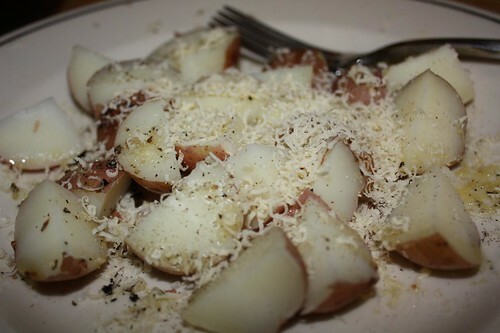 All I did was drizzle them with a little olive oil and grate some Mahon cheese over the top. Unfortunately these were potatoes I purchased at a bodega the other day prior to receiving the delicious potatoes on Tuesday. It doesn't really matter since they would have been wasted on me tonight. So I'm just going to drink ginger tea and wait for Sandra Jen to return from her party on the big boat. Luckily I have three hours of Tour de France TiVoed and Phil Liggett (who is trying out his stand up material about French bathrooms) and Paul Sherwen (who is narrating large chunks of the course description in Swahili) are in rare form. In retrospect I probably could have left this "culinary" episode off of the blog.